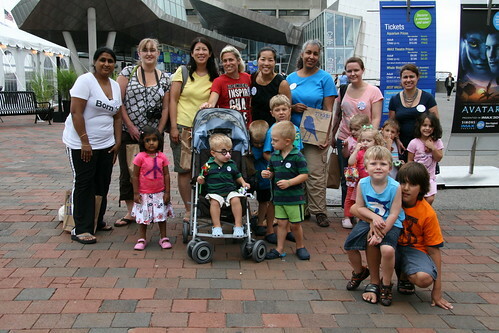 The awesome Boston 77kids Do Good Day team didn't let the threat of rain hamper their Do Good efforts on July 14. And what exactly was Do Good Day? 77kids by american eagle sponsored 77 bloggers in 11 cities across the country to do "pay-it-forward" good deeds in their community, organized by The Motherhood. The Boston 77kids Do Good Day team from left to right: Niri, Jennifer, me, Audrey, Christine, Christy, LZ and Jodi. 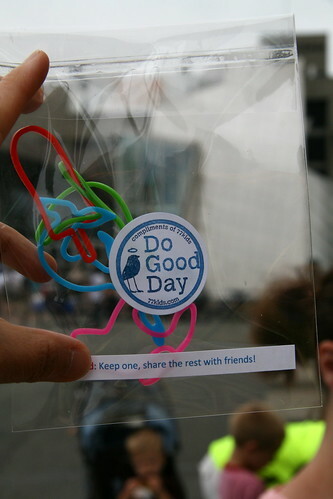 We assembled outside of the New England Aquarium to distribute Do Good Dollars and Silly Bandz to keep and share. 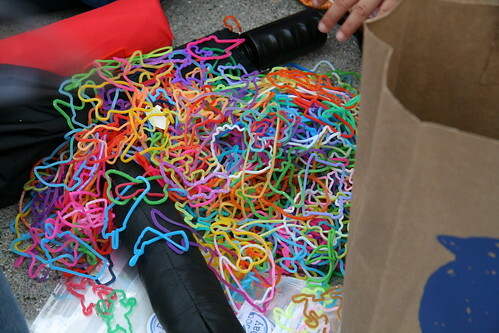 Look at that pile of Silly Bandz that we packaged up! Good thing my daughter wasn't there or she would've tried to grab them all. But in fact, all the Do Good kids present all had an extremely generous spirit. 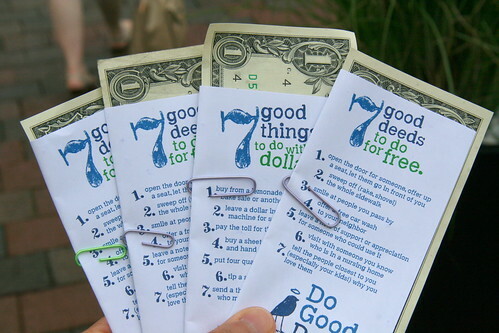 The Do Good Dollars listed 7 good deeds to do with a dollar and 7 good deeds to do for free. Buy from a lemonade stand, a bake sale or another fundraiser. Leave a dollar in a vending machine for someone else to find. Buy a sheet of stickers and hand them out to kids. Put four quarters in parking meters. Send a thank you card to someone who made a difference in your life. Open the door for someone, offer up a seat, let them go in front of you. Sweep off (rake, shovel) the whole sidewalk. Smile at people you pass by. Offer a free car wash to your neighbor. Leave a note of support or appreciation for someone who could use it. Visit with someone you know who is in a nursing home. Tell the people closest to you (especially your kids!) why you love them. It was wonderful to put smiles on kids and adults alike. 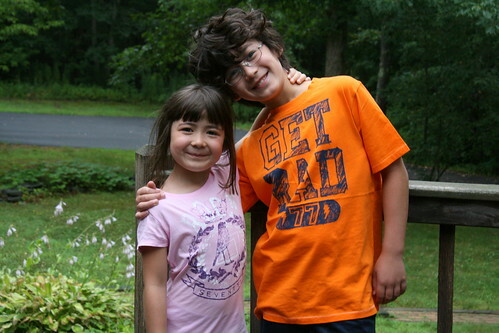 Here are my Do Good kids in their cool 77kids duds. Yes, Adam's hair is totally RAD. Thanks to 77kids for sponsoring Do Good Day.